Oversees Reliance Industries, India's most valuable company by market cap, despite stock falling 40% in past year. 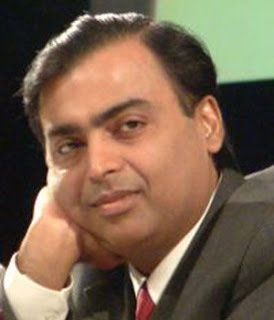 Merging his Reliance Petroleum with flagship Reliance Industries. As part of deal, will exercise right to buy back Chevron's 5% stake in Reliance Petroleum at $1.2 per share--the same price at which he sold it three years ago. Today the stock trades for $1.80 a share. Increased stake in Reliance Industries last October; paid $3.4 billion to convert 120 million preferential warrants into shares. Reliance Petroleum refinery on India's western coast began operating in December despite falling global demand and declining margins. Late father Dhirubhai founded Reliance and built it into a massive conglomerate. After he died, Mukesh and his brother, Anil, ran the family business together for a brief time. But siblings feuded over control; mother eventually brokered split of assets. Brothers may be looking to bury hatchet; played joint hosts at mother's recent 75th birthday bash. Has yet to move into his 27-story home that he's building at a reported cost of $1 billion. Ardent fan of Bollywood films. Wife, Nita, oversees school named after his father.